Borrow up to 6 items each month! 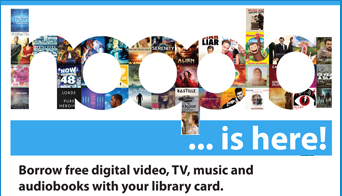 Hoopla is a groundbreaking digital media service offered by Jerseyville Public Library that allows you to borrow movies, music, audiobooks, ebooks, comics and TV shows to enjoy on your computer, tablet, or phone – and even your TV! With no waiting, titles can be streamed immediately, or downloaded to phones or tablets for offline enjoyment later. We have hundreds of thousands of titles to choose from, with more being added daily. hoopla is like having your public library at your fingertips. Anytime. Anywhere. Set up an account, browse titles, and find the right app for your device by visiting the Hoopla Digital website. Want to make sure your device is compatible? Check this list. Looking for a helpful video, click here.